I grew up in a neighborhood of all boys. My cousin, Sheila, lived three blocks north and my friend from school was one block south, but she only wanted to play indoors. Ferrell, my older brother, sometimes allowed me to tag along. But, more often than not, he would ditch me the first chance he could. What they did not know is I had a secret stash. It was a stack of 26 coloring books and a set of 64 Crayola crayons with a built in sharpener. I kept them on the bottom rung of my bookcase in a neat stack with my favorites hidden at the bottom and the least liked sitting on top. If friends came over, I could easily draw off the top and not feel bad about missing out on coloring those pages. The good stuff remained intact at the bottom. Lo and behold, imagine my joy when I saw my first coloring book for adults! I was hunting around in a gift shop for a baby present two months ago when a set of magic markers in a Roy G. Biv arrangement caught my eyes. Looking closer, I saw two coloring books behind the markers. One was a collection of abstracts and the other animals. Both were intricately sliced into small shapes ready to be colored by expert hands, not fat children fingers. I went home in a daze. It was mindboggling that I did not leave with the treasures. I thought about them overnight. Dreamed really. With Christmas a couple of days away I justified the purchase and headed back to the store only to find someone else had bought them. I got back in the car and drove blindly to Southaven. Now, I was on a mission to get my mother some coloring books for Christmas. I had taken the treat off my plate and added it to hers since I was wasting fuel to get the goods. Also, I had to make a wise decision. My mother deserved a bottom of the stack coloring book, not a flimsy grocery store top layer one. After hours of consulting the internet and flipping through about 15 different books, I settled on a champ. 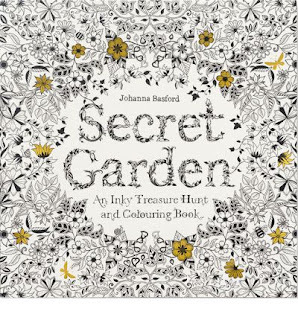 Secret Garden: An Inky Treasure Hunt and Coloring Book by Johanna Basford is the Mohammad Ali of coloring books. It has sold over 2 million copies worldwide and is being blamed for the adult coloring book phenomenon. I handed it to my mother with the expectancy of great joy. She handed me a package shaped oddly enough like what I just handed her. We ripped open our packages to find color markers and the same Secret Garden in our hands. Who was the happier? The prologue begins, “It was the first Ole Miss game that season in Jackson, and I’d been looking forward to it all summer.” Stuart Stevens was 10-years-old when he memorized the Rebel football roster. The list was taped to the wall above his bed where he could go over their names before bedtime. It was the start of what Stevens called a “perfect season in that most imperfect year.” That year, Johnny Vaught coached a winning streak and was awarded the SEC Coach of the Year. It was also the same year James Meredith walked onto the Oxford campus flanked by federal marshals to become the first black to enroll in classes. Political strategist to Mitt Romney, Stuart Stevens, suffered his first ever loss to an otherwise perfect career. Fast forward to 2012, as he walks slowly down the hall of the hotel to tell the Romney family they just lost to President Obama. The walls began to move in as he senses his own pending loss. How much time will he have left with his 95-year-old dad and 86-year-old mother? 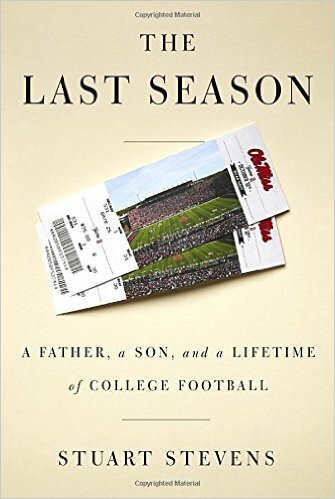 Stuart Stevens’ book, “The Last Season: A Father, a Son, and a Lifetime of College Football,” is a must read for any Ole Miss fan. Each chapter is a chronological step in the 2013 “last” season Stuart spends with his dad. Flashbacks abound as Stuart navigates the treacherous crowd with a much slower but alert father. You will find yourself smiling with the familiar Ole Miss fans as they go out of their way to help, and you will laugh at a father whose 95-year-old wit is fresh. Monday night was host to the game of a lifetime in the Moran house. The SEC championship between Clemson and Alabama put Pete and me at opposite goal posts. I was proud of Clemson for the undefeated season, but Pete was over the moon. He graduated from Clemson with a bachelor in economics back in 1979. I gathered a master’s degree at Alabama in 2005. We sat in our respective corners as the game began. I drank coke out of my Bama glass and he sipped his diet drink from a Tiger tumbler. Clemson would score and he would do a little tiger dance. Bama would score and I would demurely smile. It was rather a quiet game for the first half. After the break, Pete wanted to make a little wager. The man hates Krystal burgers and I love them. I have a hard time sitting still at Cracker Barrel, but he loves the joint. If the Crimson Tide rolls over the Tigers, I can have Krystal whenever I wish for a year, and he the same for the Cracker. Now, we were disagreeing and throwing imaginary yellow flags at every play. This bashing of heads over a football game is rare in our family, but here in Mississippi it happens all the time. Mississippians are serious about their football and it is not unusual to have a household with more than one Ole Miss and State fan in the family. 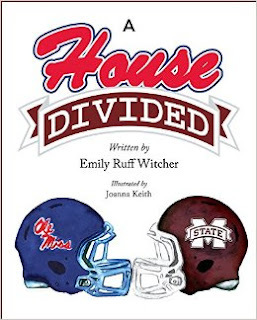 “A House Divided” is a new picture book for children that reflects the conflict of parents who support opposite Mississippi Universities. The book opens, “Long ago, in Mississippi, a crazy decision was made to create two schools in this tiny state that still remain today.” Next to the prose is a beautiful watercolor of the state and the two schools with flags a flying. The illustrator, Joanna Keith, graduated from Mississippi State in 2007. Her watercolors are vibrant and depicts both teams equally. The sister in the story sports both cheerleading outfits and the little boy holds an Ole Miss football in one hand and a Mississippi State cowbell in the other. Emily Ruff Witcher has written an engaging 38 page book filled with the spirit of fair play. She is a 2002 graduate of Ole Miss and married a 2004 Bulldog. They currently live in Madison, Mississippi with their young daughter and son. Wonder what they wager during games? A little over ten years ago, I started writing book talks for The Southern Reporter, a local newspaper based in Sardis, MS. I had graduated from the University of Alabama in 2005 with a masters in library science and really wanted to incite people to read - especially those Mississippians who shared the notorious position of being the least literate people in the United States. “According to a study conducted in late April (2013) by the U.S. Department of Education and the National Institute of Literacy, 32 million adults in the U.S. can't read. That's 14 percent of the population. 21 percent of adults in the U.S. read below a 5th grade level, and 19 percent of high school graduates can't read. As I hang my head low in despair, I want to think tomorrow will be a better day. I want to think people will spontaneously rush to the nearest public library and check out 20 books. Some for them to read, some to share with their children, some to help them grow a garden in the Spring, some to fix that dang car, and some to get them back on the road to financial success. With a New Year comes new resolutions, and I resolve to make 2016 the Year of Reading! So much of a good life is wrapped up in reading good books. Sharing thoughts from a book can help us all understand how and why people do what they do. Books make you smarter, and I would rather my neighbor enjoy intelligent thoughts about improving our community than wallowing in the ends and out of a Kardashian. My New Year resolution, and this is crazy, is to make Mississippians read! I will be telling you about great books and I dare each and every one of you to read these great books and books similar to them. After reading, go out and share your thoughts with others. 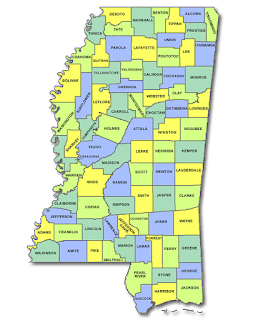 I dare YOU to make Mississippians read, too! 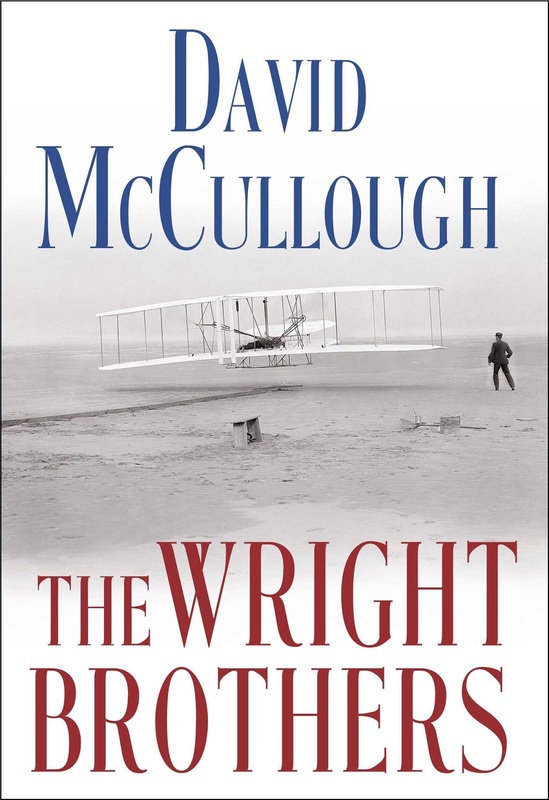 “The problem of flight” was the phrase used often by the Wright brothers. While others were out trying to solve it, the brothers thought about it. All family members were involved in the thought process, too. Baby sister, Katharine, complained that “the problem” consumed the boys and she wished they would socialize more. Thoughts varied such as balloonist were not true pilots. Ascending because one’s craft was lighter than the surrounding air was hardly a skilled flight. The pilots did not control the airship but floated about as the wind wished. The boys would have to look elsewhere for concrete evidence of flight. The brothers suspected current flight enthusiasts were throwing money at the problem void of scientific facts. Wings, blades, wires, wood, etc. were paced together in arrangements that people thought would work based on bird shapes. It was after meeting Octave Chanute that their suspicions were confirmed. He could not produce any papers to back up his designs. The brothers were baffled the most by men willing to strap their bodies to an untested machine for the sake of the problem. Many times these same men would be memorialized a week later and the obituary wrapped around fish, but nothing was gained. If the boys were to risk their necks, somewhere there better be proof of the possible. It was Wilbur that insisted the problem could be solved. He turned to the experts – birds – spending hours observing their patterns in the sky. He went to the Dayton library and checked out as many books on birds that he could find. He read, watched, and thought about the physics of flight. Wilbur’s eye for the larger birds such as hawks, eagles and albatross lead him to solve the problem. Birds are not lighter than air thus must provide lift and thrust with their powerful wings and legs. Birds also do not float midair but turn, climb and descend. He noticed the birds using their wings and tails in combination or apart to make directional and height changes. For Wilbur, the key ingredient for flight was wind. “No bird soars in a calm,” stated Wilbur. It was only after many hours in the air that Wilbur changed his mind realizing wind could be generated with more power from the props. Although, we know Orville was the first to fly, it was thanks to his big brother. 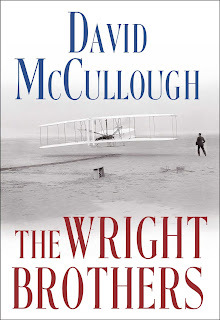 Wilbur, as you will find out from David McCullough’s new book The Wright Brothers, was a genius. Delightful reading, I now follow the Mississippi Kite through the sky with greater admiration. It was lost or so it seemed. The 1939 Olympic gold medal for winning the eight-oared rowing competition was placed somewhere in the house for safe keeping. The one who hid it also forgot where, and after looking all over the family gave it up for lost. Years later, while remodeling the home, workmen found it in the attic insulation. Apparently, a squirrel had taken a liking to the shimmering gold and brought it back to the nest. The day author Daniel James Brown heard this story was the day he had a revelation. He was visiting Joe Rantz for another matter altogether. Joe invited him to discuss Angus Hay Jr. an old friend and son to the main character in Daniel’s recent book. The same book that Judy, Joe’s daughter, was reading to him aloud when Daniel appeared at the door. With joy, Joe spoke of his learning to row and the teammates that shared his daily routine. He reminisced about the cold mornings under gray skies and above the steely waters of Lake Washington. He retold Daniel the feeling when all rowed in unison for a win. But, when he mentioned “the boat” his eyes could not hold back all the water pulled by the oars of time. Daniel James Brown’s new book, The Boys in the Boat: Nine Americans and Their Epic Quest for Gold at the 1936 Berlin Olympics is worthy of your time. Like the squirrel in the attic, you will want to hoard this book and the stories within. Oh, and it is about the boat. Why wait a year? This bothered Leonard. Inetta said it was to make sure she was sufficiently “good and dry.” He thought maybe it was more like time to find a wife or Jesus. Inetta was always up to something. It was in her character to hope for these thing, but also in his character to not. In preparation of this event, Leonard has spent the year giving away most of his belongings. It was easy and no one seemed to notice since he was giving away Inetta’s at the same time. The things he had left were either for the trip or to be given away en route. The truck had just enough gas to get Leonard to the cliff. He had extra kibble to give his neighbor Winnie for seeing after his dog, Stitches. Another neighbor, Vaughn Hobart, will get a surprise with his mail. Leonard left a set of keys to the house and the title to his truck in the box. The day is set in motion, but Leonard is running ahead of schedule. He wants to time the event at sunset. He thought his haircut would take longer. He gave away his mirror two months ago and can only imagine the curled up mess he will be presenting to the town barber, Dave Grantham. Leonard also made a promise to Inetta, although he never spoke of it. He promised when he saw her again it was with a clean head of hair. The only thing that annoyed Inetta was a mess of unruly hair. He teased Dave about not having to cut the crop circle that sat high on his head while giving him the reverse tree line special. 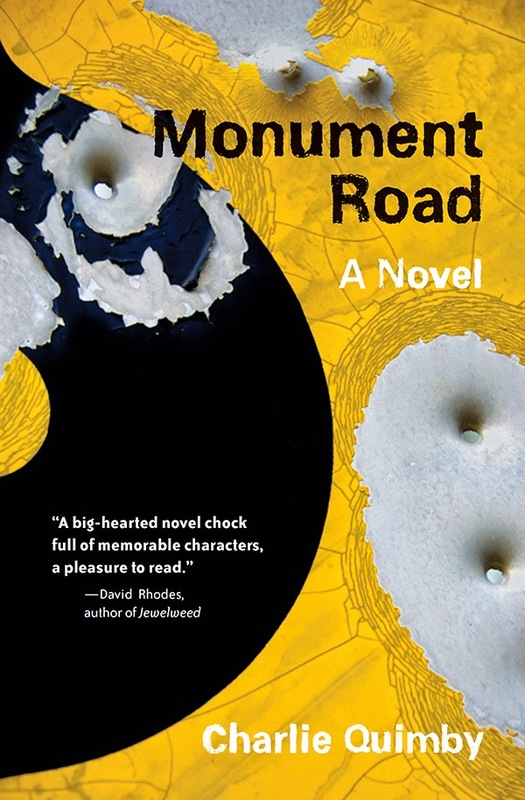 Released in 2013, Monument Road is the first novel by Charlie Quimby. Not his first attempt at writing though, Quimby has written plays, then criticized plays, and now makes individuals sound good for Harvard Business Review. You will love how he turns a phrase. Dead Wake will not disappoint. Larson keeps the stories short within the 353 pages alternating from three different perspectives. For example, one chapter is about the Lusitania. The following chapter discusses the German submarines fearfully known as U-Boats. Then the third chapter talks about Room 40 where code breakers worked to decipher German transmissions. The Lusitania was known as one of the greyhounds in the Dreadnought era of transatlantic crossings. A member of the Cunard Fleet that included the Umbria, Etruria, Carpathia and Queen Mary to name a few, the Lusitania was a luxurious superliner capable of 26 knots. Called Lucy for short, the beloved ship successfully completed 201 Atlantic crossings by April 1915. Walther Schweiger was the German captain of Unterseeboot – 20 (U-20) that sent the Lusitania to its watery grave. According to the book, the U -20 was 210 feet long, 20 feet wide, and 27 feet tall. The living space was a cylinder in the middle while two cylinders on each side were filled or drained of water depending on the desired depth. Because submarines lost contact with their land base, the captains were allowed to make decisions without orders from superiors. It was said a U-boat took on the personality of the captain. Schweiger was an ambitious happy man caring enough to aide in the rescue attempts after torpedoing a helpless ship. U-20 was known as a happy ship. In room 40 of the Admiralty, an old building overlooking the Thames, a group of code breakers deciphered the day’s transmissions from U-boats once they entered the North Sea. The Germans plotted the seas around England and Ireland in 6 mile squares. When chatting sub to sub, captains would indicate where they were by a number that represented one of the squares. Room 40 knew exactly where each U-boat was since submarines stayed in continuous contact. 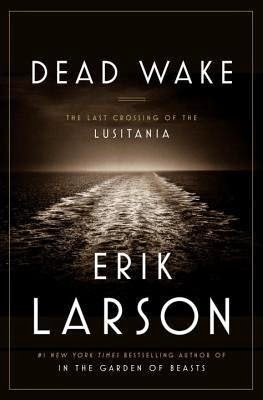 As I write this, Dead Wake is number one on the New York Times bestseller list having shot to that coveted slot from its release date of March 10. Four weeks on the list and four weeks at number one is a feat all authors aspire to achieve. It is certainly a tribute to Larson’s writing talent and readers will find themselves enthralled. Axl and Beatrice are being denied a simple flame to keep them comfortable at night. They live in a mud cave of many chambers on the side of a hill amongst their small Briton community. Described as looking similar to a rabbit warren, the elderly couple have the smallest room. They seem to remember having lived in the center of the community, but now are at the end with the room connected to the community and the outside. Beatrice hardly ever complains, but she feels the lack of a candle is disrespectful. Axl has intervened a couple of times when she brings up the fact to community leaders. Why are they denied light? Does the community feel they cannot be trusted to extinguish it before sleeping or leaving the room? Is this the way they are to be treated in their old age? Are they a foolish pair? At night, when Axl and Beatrice lay down they are kept warm by many wool blankets. A mere candle would not add heat but would allow them to stay up a little later conversing. What is there to say, though? Axl and Beatrice are losing their memories and have little to talk about. It is an odd thing, but the community is also forgetting even the smallest of events. Just last week, a little girl went missing and a search party was organized. The girl returned on her own a couple of hours later and her mother acted as if she was out tending the chickens and nothing more. The search party came back after another couple of hours discussing some bird they saw while returning from a long forgotten quest. They joined the community at the great fire in the center of the warren to share the news of the wren eagle only to forget and start arguing over whether they saw shepherds on the hill during their return. Beatrice has a theory. She thinks the shared forgetfulness is caused by the mist that surrounds the hill and the caves below. When it is thicker, all memory is erased and when it is thin she can at least remember her day and retell it to Axl. It is because of this dishonor with the candle and the community forgetfulness that Axl and Beatrice decide to leave the warren for their son’s home far away. They feel they must go soon for they may forget they have a son and even lose his name. 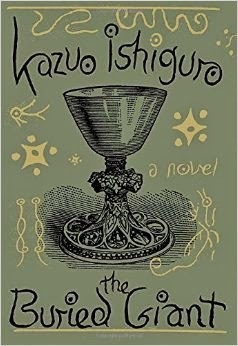 The Buried Giant by Kazuo Ishiguro is his seventh book taking ten years to write. This author of The Remains of the Day and Never Let Me Go is stretching his talent by producing a never before told fantasy with amazing twists and turns that may make forgotten memories a blessing. I got an exciting email last night from Dr. Sue Clifton. She is one of 37 talented writers who will be appearing at the Author Rodeo Roundup this Saturday, March 28, from 2:00 p.m.to 4:00 p.m. on the Senatobia campus of Northwest in the R. C. Pugh Library. Clifton is a retiree who fly-fishes, ghost hunts, and writes. She has eight novels under her belt. She also divides her time between homes in Mississippi, Arkansas and Montana with husband Woody. While in Mississippi, she substitute teaches English at South Panola High School. In 2014, she enhanced her senior English classes with a writing project. She had started, Freeze Tag! and was about one-third done when she asked students to help her finish it. From the group, two students stood out. Freeze Tag! was released in February of this year and has three 5-star-reviews on Amazon. It is the story of 17-year-old Anna and her eight-year-old sister Lilly. Their dying mother disappears and the two trek off to Memphis in search of their homeless Grandmother, Tass. Once located, the three return to Arkansas and assume Lilly's guardianship. Things are not all rosy and Anna sneaks away in the middle of the night taking Lilly to a 1890s Victorian mansion on the Tennessee side of the Smokey Mountains. The Clayton House and property were willed to Anna's mother by a reclusive aunt. All is not as it appears as the home proves to be filled with ghosts. 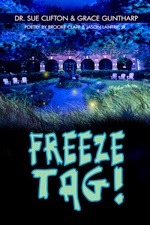 Dr. Sue Clifton along with Grace and Brooke will be at the Author Rodeo Roundup to sign Freeze Tag!. All profits from this book go to South Panola High School for the purchase of laptops to be used by the English Department. One of the most exciting times for a woman is pregnancy. The questions that are never ending start to form in her head as her body does some really strange things. Naturally, she immerses herself in making the perfect nest and her family and friends shower her with well wishes and gifts. She is about to take on a lifetime of love and she works hard to make it perfect. 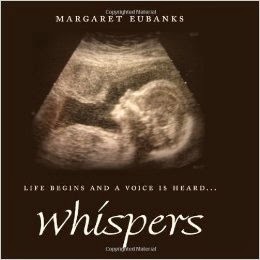 In Margaret Eubanks’ Whispers: Life Begins and a Voice is Heard… the mom is asked to take a little quiet time and record the events as they are happening. The unborn voice is whispering little secrets every day and mom needs to slow down to hear the aspirations. On the next page, Mom is asked to journal her thoughts about the day she found out she was pregnant. The whisperer tells her to, “Write it down Mom. Someday I’ll want to know.” Across from the page is a lined paper for her to fill out. This paperback book is the size of a children’s book. The font is large and sparse. The pages have plenty of lined paper for mothers to record the events as they unfold. The pictures are large and meant to carry the story along. This children’s book format is special as one day it will be read back to the child for which it was produced. Whispers becomes the story of birth for one lucky little-one who has a mother with the forethought to write it all down. The book, once filled with the experience of birth, will become a family treasure at first requested daily by the child to be read repeatedly, then tucked away on a shelf to be rediscovered years later and again treasured. Born in Mississippi, Margaret Eubanks currently resides in the Batesville area. 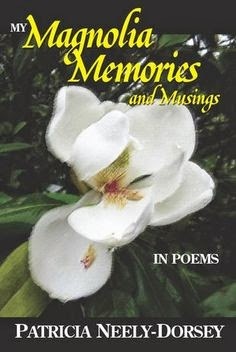 Whispers, written in 2006, is the first of two books by Mrs. Eubanks. She will also be bringing her, Goodnight, Sippi, I Love You to the Author Rodeo Roundup Saturday, March 28 from 2-4:00p.m. at the R.C. Pugh Library on the Senatobia campus of Northwest Mississippi Community College. This past weekend, I finished the Little Rock Marathon with a person I met that morning who literally changed my thinking process for the whole race. A select few (super slow) runners were allowed to start the race Sunday morning at 6:00 a.m. while the rest slept in until the 8:00 a.m. start time. The group we formed was happy and eager to get things on the road. I started to run in front of them just to make space and got slightly to the left of a man who was doing the same thing. I believed he was talking to himself when he said, “This feels good.” He noticed me and I gave him an approving nod. Five minutes passed and he repeated himself and I again nodded. He was an older man and I started to match him step by step. He turned to me and said, “This is a great pace. What do you think?” I agreed and then we exchanged race strategies. Yes, even those runners in the back come to a race with a plan. We also shared that this was our third marathon to run and we liked the early morning start that meant there would be food left. About two miles into the race, we turn a corner and the State Capital sat lit up on the hill. Nearing the top we saw the police lights where the rabbit runners in our group were beginning to make the turn. He turned to me and said, “Look at our elite group.” I started laughing because marathon organizers make a big deal out of “elite” runners who will possibly win the race and money. Obviously, no one in our group had a chance. At the 11th mile it started to rain lightly. My new friend said, “My wife thinks that mist makes you look younger,” and he sticks his face out into the rain to get a good dousing. For a 70-year-old man, he looked good and I laughed and then proceeded to do the same maneuver. I count my lucky stars that I met this positive man and ran this race with him until we parted at mile 24. The weather was cold and wet, the hills were unforgiving, and the roads were packed rocks, but not once did either one of us say a disparaging word. Her poem, “Meet My Mississippi” is currently being considered for the official state poem. I am so in awe of author Willie Morris. 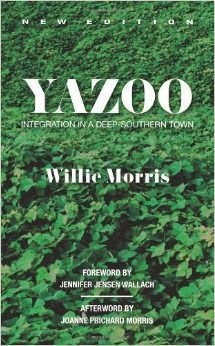 During our snow break, I read Yazoo: Integration in a Deep-Southern Town, Remembering Willie, Good Old Boy, and The Ghost of Rowan Oak: William Faulkner’s Ghost Stories for Children. In the last book mentioned, he wrote the introduction portion for one of his best friends, Dean Faulkner Wells. Morris mentions in Yazoo that he was reluctant to leave his boyhood home and walk around the town where he grew up after writing his bestseller, North Toward Home. Three years after publishing the book, he returned to the community to begin Yazoo. It was his hope to flesh out the trials and tribulations of forced integration in his own Yazoo City High School and maintain a dignity to all those who he was about to write. It was Willie’s childhood friend, Bubba Barrier, that got him out and amongst his people. He called Willie who was living in New York to let him know that North Toward Home was selling like hotcakes in town. The drugstore had a line around the block to buy it and over 100 holds on the library copy. Bubba eased Willie’s fears by explaining that the reaction to the book was split. Fifty percent loved the book and were very proud of it and the other half hated it. Bubba felt that the half that hated it were mad because they were not mentioned. It took another group of friends to talk Willie into returning to Mississippi to live out the rest of his life. Larry and Dean Faulkner Wells paved the way for Willie Morris to be the first writer-in-residence at the University of Mississippi. Larry Wells will be appearing at the second annual Author Rodeo Roundup, Saturday, March 28 at the R.C. Pugh Library from 2:00-4:00 p.m. on the Northwest Senatobia campus. As a panelist, Wells will be discussing his new Yoknapatawpha Press release of RIOT: Witness to Anger and Change by Edwin E. Meek. Last year, I went from a slow 13 minute mile to a glacier 14 minute mile pace and gained weight all while training for a marathon. What? The marathon schedule I choose emphasized mandatory long runs on the weekend for endurance, and optional runs during the week. The two books I read this week remind me of my aha-moment with the running books. Simply Weight Loss by Dr. Mike Cockrell and The Hummer Garden: How to increase your Hummingbird Population by Lisa Cockrell and Chad Martin provide practical tips needed to lose weight and attract humming birds to your home. These small books can be enjoyed in a minimum amount of time, but are chocked full of aha moments. For instance, Dr. Mike states there is no magic solution to weight loss, but if pressed for one he says, water. He then gives five examples of the effects of water on the body. Lisa and Chad filled their book with photographs that emphasis the importance of color and grouping of hummingbird attractors. Trees, flowers, vines, feeders, and a quiet space set the perfect table for hummingbirds to feast and fellowship. A picture in this book is truly worth a thousand words. Dr. Mike Cockrell is a practicing family physician in Senatobia, Mississippi. His wife, Lisa, attracts over 100 hummingbirds to her meditation garden in Como every year. Chad Martin not only co-wrote with Lisa, but he co-owns Laurel Rose Publishing with Dr. Mike. The company was founded in 2012 to give would-be authors an affordable place to publish. Dr. Mike, wife Lisa, and Chad Martin will represent both the writing and publishing side at the second annual Author Rodeo Roundup on March 28 from 2:00 – 4:00 p.m. at the RC Pugh Library in Senatobia. Jayrod could hear the bell his teacher, Mrs. Snitch, wielded with great enthusiasm off in the distance. He was stuck to the earth unable to make a decision. In front of him was a deep gully full of honeysuckle and briars. On the other side stood the class bullies led by Horace Plunk and his cronies, Bobby Greenhall and Tony Farse. The vine swung near Jayrod’s head as Horace taunted him with insults. The other two took turns clucking like chickens and calling him scared. In the distance, the bell rang again like Mrs. Snitch was trying to shake off a bee that had landed on her thick wrist. It was now or never as Jayrod grabbed the vine, closed his eyes, and let it drive him to the other side. Just as he left the earth, it occurred to him that once he got to the other side, Horace was just going to push him back instead of allowing him to make a safe landing. No need to worry. Jayrod did not have the momentum to make it. He could feel the rough vine slowing and he opened his eyes in panic. He had a quarter to go when the vine began to tilt back and head in the opposite direction. “The Night Train” by Carl Purdon is the story of Jayrod Nash, a nine-year-old growing up in a small town in Mississippi with a mousy mother and an alcoholic father. 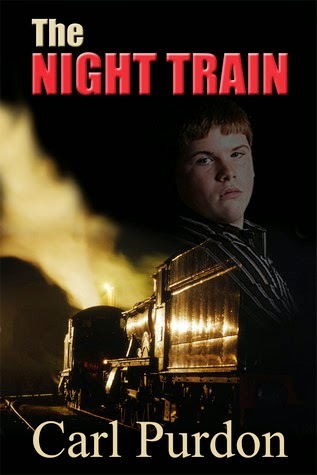 The title refers to his possible salvation, a train that can take him to a better place, a better life, and safety. Purdon lives in Pontotoc, Mississippi, with his wife and two of their four children. In February of 2012, he released this debut novel, “The Night Train.” His fourth novel, “Red Eyes,” a sequel to “The Night Train,” is scheduled for release on March 23, 2015. His writing style has been described as a mixture of Mark Twain and Merle Haggard. Carl Purdon is one of the many authors and publishers appearing at the second annual Author Rodeo Roundup on March 28 from 2:00 – 4:00p.m. at the RC Pugh library in Senatobia. Mary Rowlandson’s life is in jeopardy. Two weeks ago she was shot at and taken as spoils of the siege on her small village in Bay Colony, Massachusetts called Lancaster. Her husband left the night before the ambush to get help from a Boston militia. She still awaits his return. In the fight, Mary lost her sister, Beth. She saw Beth being struck down at the threshold of her burning house by a devil that looked like he was enjoying the experience. One blow by the club would have sufficed, but the devil continued to defile her and then set her aflame. Mary viewed other horrors as she tried to run but the buckshot that was mostly taken by her small daughter Sarah was also causing her to see double. Or, was the excruciating pain around Mary’s waist a result of Sarah’s legs squeezing tight on the wound in order to stay on Mary as they made haste? The same devil that fouled Beth was ready to club Mary when he suddenly stopped. He pulled off her kerchief and yanked at her hair. He stepped closer to her and began to lick a curl as if it was made of honey. He then pushed the woolen cap off of Sarah’s head. Instead of being killed, the devil herded them to an opening in the stockade. Shoving them through, another devil grabbed her and threw a noose made of hemp around her neck. The other end of the long rope was attached to a horse, one of Mary’s own. Sarah has been dead now for a week and Mary is doing her best to forget the child and concentrate on her living children. She spoke with her son, Josh, earlier that week and found he and his sister were slaves to an Indian family in a nearby village. In that brief encounter, Josh had to tell Mary what happened to Goody Joslin. He cried as he retold the ugly affair. Ann Joslin was going into labor as they walked away from the fighting and her wails were irritating the warriors. Josh said he and some other children were made to dance around her in a circle. When that did not stop the noise, one of the devils jumped atop her and cut her wailing throat. All Mary could think to console him with was trust in the Lord. All her Puritan beliefs were not helping though. And where was her husband? Was she not worth rescuing? 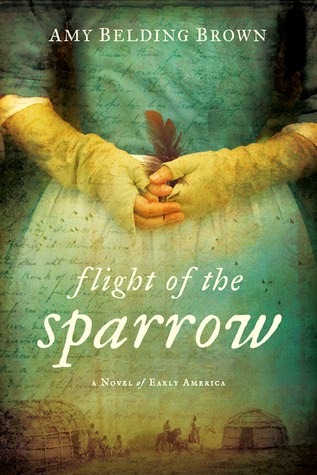 Set in 1672 early America, Amy Belding Brown’s book Flight of the Sparrow is an intriguing page turner and the first book in this semester’s Reading Roundtable at Northwest. 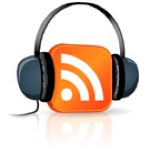 Digital Librarian Maya Berry will lead the discussion and Amy Brown will Skype in on January 27 at 2 p.m. at the R. C. Pugh Library in Senatobia. The Sinclairs have money. Tipper and Harris have so much money that they own an island off the coast of Massachusetts called Beechwood. Each summer the whole clan, consisting of three divorced daughters with eight children and one friend, boat out to the island to join the Sinclairs. On that island are four beautiful vacation homes. The Sinclair’s three-story Victorian, Clairmont, is filled with priceless art and an extensive library for summer reading. Cadence "Cady" Sinclair Eastman, the first born grandchild, loves to spend her time amongst the books in the comfy library instead of basking in the sand and water. Each daughter owns a two-story beach home at different points on the island. The Eastmans own Windemere that sits on the northern point. The Sheffields stay in Cuddledown on the Northeast corner and the Dennises live on the southeast corner in Red Gate. The homes, tennis court, boathouse, staff shack, beaches, and docks are connected by wooden walkways. The Sinclairs are a beautiful bunch. Each is tall, golden and athletic, with radiant smiles of sureness. Standing at a distance, one cannot see lawbreakers, addicts or failures in the group. It is only the closest family member Cady who recognizes the cracks in the façade. Cady is 18 years old when she retells the story of the fall of the Sinclairs. She is recovering from an accident that happened on the island within summer 15, and we are privileged to hear of her life as she recalls the summers before. Cady spent each summer with Johnny, Mirren and Gat. The family calls them the Liars. The lies are never used to deceive, but, in fact, such whoppers that no one would ever believe. The Liars are all the same age. The family calls the next group of grandchildren in similar age, the Littles. Cady wants readers to know she is alright and still living with her mother and three golden retrievers in Burlington, Vermont at the beginning of the book. She now sports thick black hair having dyed it after summer 15. Perhaps, she hopes people will not see a Sinclair resemblance. When Cady returns to Beechwood for summer 17, having spent summer 16 traveling Europe with her father, the Liars are slow to warm to her new look and attitude. 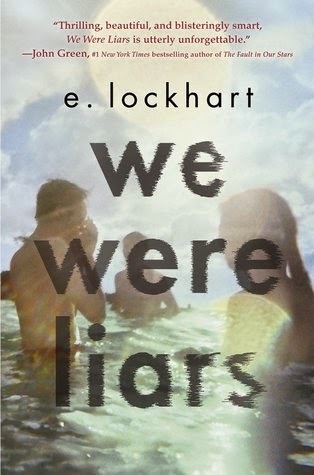 We Were Liars by E. Lockhart is absolutely the best young adult book out there. No matter how many hints Ms. Lockhart leaves, readers cannot predict the end. Here is my hint. Cady is not a reliable narrator. Now that the movie Unbroken has been out in theaters for a couple of weeks, I have to state my opinion that the book is better. One might reason that in the movie, viewers can see the movements of the characters or be captivated by the beautiful scenery. The visual is very seductive, but I stand unmoved. In all cases, the book is always better. Gone with the Wind is a perfect example of the quality of the book versus the movie. According to the Oscar Award’s database, the movie was nominated for 15 Oscars and won 10 including best actress, best supporting actress, art direction, directing, cinematography, and screenplay. Not bad, but the book won higher praise with the Pulitzer Prize for Margaret Mitchell in fiction. Both movie and book are quality according to the experts, but the one difference is the insight into characters. Movies allow for some insight by either having characters tell their feelings to one another or speak out loud for no reason which is awkward. Books explain in great detail what characters are thinking, feeling, and planning. 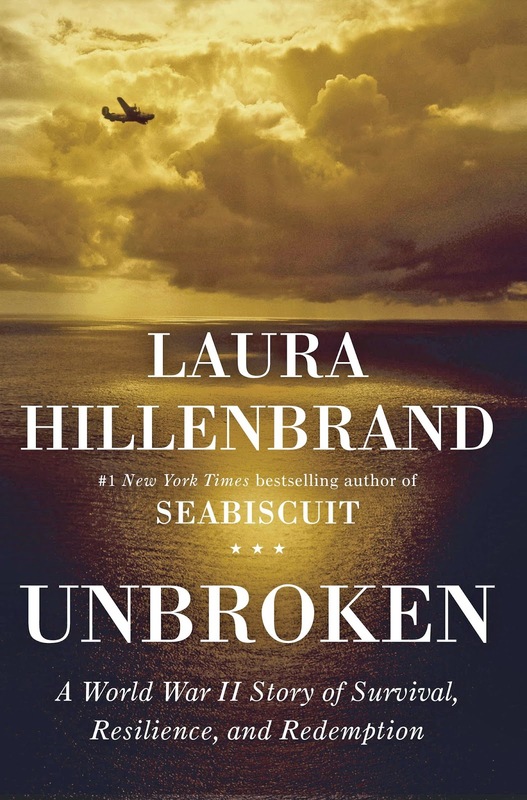 You cannot possibly know what main character, Louis Zamperini, in Unbroken is thinking, feeling or planning unless you read the book or he tells another person in the movie. Why did Louie run so poorly in the Olympics? In the book, readers learn that he did not have enough money for the trip so he stole food. On the ship he went for the pastries and while in Germany he made off with a loaf of bread. The book Unbroken really puts readers through the wringer during the lost at sea segment. You starve with Louie. You listen to his mother’s Italian recipes and experience the shark’s fin as it runs underneath the raft past your spine. You also become closer to God and your own immortality. The movie’s time perimeters allow viewers a couple of these events before being found by the Japanese. The 47 days of agony are reduced to 25 minutes on film. At least in the book, it will take you a couple of days to read the section. Not to take away from the movie, but my husband had a hard time believing all these things happened to one man and he could never shake off the fact that he was watching a movie set. 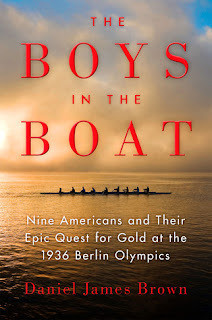 Both author, Laura Hillenbrand, and director, Angelina Jolie, were blessed in the fact that they had Louis Zamperini in person to ask how he thought, and felt and the actions he took to survive. I am reading a book with the underlining theme of regret. 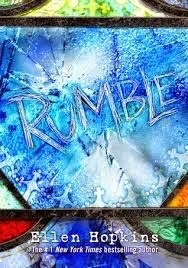 Rumble by Ellen Hopkins is a young adult book with an 18-year-old main character who is full of regret. What can he possibly regret this early in his life? Reflecting on my life, one regret sticks out. I was 24 years old living in Memphis and proudly flew my 1969 Citabria back to Smyrna to show off to all the guys. As an aerospace student at MTSU, I worked the counter at Smyrna Air Center for two years. All the flight instructors used to be classmates except one, Col. Hawn. Col. Hawn had his own office with a small desk and chair across from the counter. He would lean his chair back and kick up his legs on the desk to keep the pressure off his knees critiquing all our bonehead maneuvers through the smoky haze of his soiled pipe. He was once a dashing Spitfire pilot in World War II. His war photo says it all. Col. Hawn looks at the camera, hat askew and fresh leather jacket bound, grinning with a pencil thin mustache. His career started outside of Memphis in a plane he rebuilt from a wreck. His instructor, Red, was paid in whiskey. In his office was a book with pictures of all the airplanes of the world. Col. Hawn circled two thirds of the military planes indicating the ones he flew left seat. At the airport, he had a Cessna 150 and a Swift that he kept clean in a hangar. It was necessary for me to fly the 150, but it was an honor to be allowed to pilot the Swift. Just thinking back, I can smell his pipe and see the yellowed interior of his little 150. We flew it down to Muscle Shoals for my first cross country and he slept on the return trip forcing me to navigate as if alone. All the jokes about Col. Hawn’s narcolepsy finally made sense. In order to fly his Swift, I had to open the hangar, tow the plane onto the tarmac, and await further instructions. It was a blustery day in February, both of us suffering with spring fever, when we took off. The Swift literally jumped into the air and we were at altitude in no time. Col. Hawn took me through a series of rolls and loops. The thing I most remember is his grabbing the wheel with both hands and running up behind a Cessna 152 pretending to shoot machine gun style with his fingers. He was fun. My regret, and I shudder thinking about it, was not allowing him to pilot my plane. When I returned to Smyrna that day he was 76 years old and using a cane. He asked and I begged off blaming a family obligation in Gallatin. His eyes fell and so did my heart. I had possibly 30 hours logged in the plane and I was afraid that if something happened I would not be able to land from the back seat. I also had concern about his weight. He was a tall man and easily weighed 250 lbs. To this day, I hate that I let my fear keep this sweet man from having fun. Sixteen-year-old Ada lives with her mother, Mutti, and grandmother, Omi, on the west side of Berlin. Eighteen-year-old Stefan lives with his grandmother, Grossmutter, on the east side. Ada is allowed to visit Stefan four times a year. The visits started when she was two and by age 12 she was in love with him. Ada’s life is free on her side of Berlin. Her family squats in some derelict apartments with shoddy heat and water, but all free. She roams the night, down different streets on a borrowed bike and no one ever questions her. Her current Cleopatra style hair is pink like Bazooka bubblegum attesting to her ability to purchase a variety of goods with money she makes at a Catholic daycare. Stefan lives in a concrete apartment that has been assigned to his family. He is currently an apprentice at the ice factory as assigned. Although, his grades qualify him to do more exciting things such as being a cosmonaut like his late grandfather, his study of the stars is free and no curfew limits his use of the tiny balcony. To visit Stefan, Ada must stand in line at the border marker and go through a couple of security checkpoints before passing to the other side. The body searches can be intense and she must hide contraband like maps in her shoes. Stefan will have to make “the leap” as Ada refers to it in order to be with her. The leap includes scaling two different razor-wired fences, weaving through either the surface barriers called asparagus grass or the anti-vehicle barriers called hedgehogs, passing by 24/7 illuminated strip, crossing an access road and control strip, stepping over the anti-vehicle crash barrier and then finally climbing the wall. All this weaving and scaling will have to be done while guards try to shoot you dead. They could be aiming at you from the watchtowers that are spaced 250 meters apart. Or they could be awaiting you on the footpaths as they patrol on an hourly schedule. Wherever they hide, they do not seem as dangerous as the beautiful Ada who tempts him. 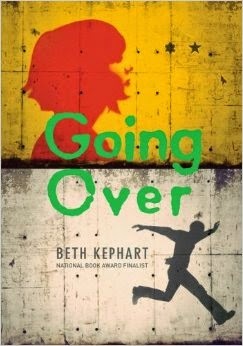 Set in 1983, “Going Over” by Beth Kephart is highly engaging. There is more involved than the Berlin Wall escape for young adults. Readers also meet 4-year-old Savas from one of the many Turk families brought into Germany after WWII to restart the economy. Oh, and I forgot to mention that pink-haired Ada is also a graffiti artist. Seeing the Macy’s Thanksgiving Day Parade is on my bucket list. It is now in its 88th year as a parade, but in 1924 it was called Macy’s Christmas Parade complete with animals from the Central Park Zoo. If one does the math, 2014 minus 1924 equals 90 years. In 1942, the rubber used for the balloons was need for the war effort and the parade was suspended for two years. The famous balloons began as early as 1927 with Felix the Cat, and continues today with Snoopy having the most appearances. I thought it quaint, but in 1929 makers of the balloons installed slow release valves for the helium. This allowed the balloons to float free for a couple of days gradually returning to earth. A return label was sewn into the rubber for finders to mail the character back to Macy’s in exchange for a small gift. 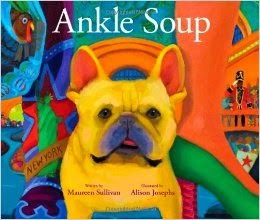 “Ankle Soup” by Maureen Sullivan is the story of a French bulldog named Carlos and his special day at the Macy’s Thanksgiving Parade. As one can guess, he spends most of the day not viewing the balloons above but the brightly colored socks, hose, and tights of the many people who attend or participate in the event. On the next page, readers will see a big yellow taxi with Carlos on the lap of mistress in the backseat. In the skyscape, parade balloons bob up and down with Kermit in the lead followed by three red and white Macy’s stars. The famous clump of circus balls announces Chloe the Clown next followed by Clifford the Big Red Dog who sticks his nose out from around a building. Sullivan has written three picture books featuring her real pet, Carlos. They all share a rhythmic pace as mistress takes Carlos on adventures around New York City. All three books are illustrated by Alison Josephs whose style is bright colors like Mississippi artist Wyatt Waters. This book is a fun and unique way to see the famous parade. Edgar Allan Poe lives! 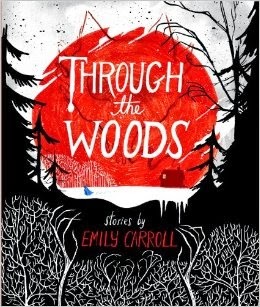 I read Through the Woods by Emily Carroll and could not help but think of the great poet. From her first story, readers will get the unmistakable feeling of a descent into madness by the characters that haunt this debut graphic novel fated for awards. The book begins with a scary introduction, then spirals readers through five increasingly macabre stories, and finally spits one out with a freaky conclusion. Readers open the book to face black cardboard feeling paper and then the scene opens with bare limbs in a snow filled night with a red moon. Our heroine leaves blue indentions in the snow as she walks the lonely stretch of woods. The clouds are wispy red reflecting off the moon and she walks cloaked in a blustery blue. Through winter pines dripping from the cold, she continues on her solitary journey until the pages become increasingly black. Next page and one faces a blood red-filled page on the left with an open book on the right. The book holds one ribbon of red, just like the color on the opposite page, signifying a bookmark with a forked looking tongue. Above the book are the words “An Introduction” written by hand. There are no computer generated fonts in this comic. A child reads in complete darkness with only the desk lamp attached to the giant headboard lighting the bed. The child can be male or female, it is for the reader to choose, but the green comforter betrays a gender with little pink, purple and yellow hearts. As she reads, she begins to wonder what is beyond the stark light. Will something be out there to grab her when she reaches to turn it off? “Our Neighbor’s House” is the first story set in the early 20th Century. The three sisters, varying in age from child to teenager, are left in a farm house starving as their father hunts in the woods. He has left them instructions to walk to the neighbor’s house if he does not return. The tween tells the story as they try to entertain themselves with games at first. The next day, they start to clean the house made of gray wooden floors, walls and stairs. On the third day they all lay around in a funk. “That evening, the sun set bloodred in a white sky. And when I saw it…I knew our father was dead,” stated the middle sister. Remember reading Eleonora, The Raven, The Tell-Tale Heart, Annabel Lee and The Pit and the Pendulum (just to name a few of Poe's works) and contemplating your own mortality? I wish I could be there as you finish this book, just to see your expression. It was a hot humid day in New York City when Celia Szapka climbed into the packed train at Union Station. She had splurged and bought a new black and white dress that looked fairly smart on her 24-year-old figure, just for the trip. She was also sporting her Times Square find, I. Miller shoes that she had to do some quick maneuvering to keep clean in the crowd. Celia was not from Manhattan. She had moved to the island after many months of convincing her Polish mother that it was the right thing to do. See, she was the baby and as such was expected to stay home with her mother and father until she could get work close to their Shenandoah, Pa. home. She felt this polish tradition a little constricting, especially, after seeing both her brothers, Al and Clem, head off overseas to fight in the war. Then there was the older sister who ran off to get hitched in New Jersey. Oh, and Kathy, her other sister was attending college with money the family scrimped from working the coal mines. It was Celia’s oldest brother, Ed, who recognized her despair in sooty Shenandoah. Ed was a gentle soul and destined for the priesthood from an early age. He currently presided over a tiny border-town church in Texas, but was visiting to see Kathy off to school. He had talked Celia into taking the Civil Service test back in the early ‘40s, but every assignment that was generated by her passing score was deemed too far away for her mother’s comfort. Celia showed Ed the latest job offer from the State Department. The letter offered her a secretary position in Washington, D.C. making $1,440 a year! Father Ed was a brother on a mission and once he was done with Mary Szapka her full blessing was bestowed on Celia for the move. 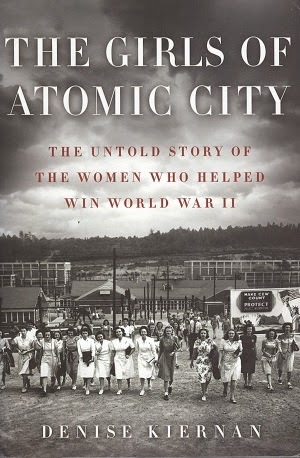 The Girls of Atomic City: The Untold Story of the Women who helped Win World War II by Denise Kiernan is a must-read, especially with Veterans Day right around the corner. Also, you will be among many fine Ole Miss Freshmen students who are participating in the excellent Common Reading Experience led by Melissa Dennis using this very same title. Willie Morris once said, “He must always be a stranger to the place he loves, and its people.” I met one such stranger last night in my reading who shaped civil aviation in our country and lived just west of Como back in the 1950s. Yet, today, her name is virtually unknown and her love, lost. Phoebe Fairgrave began her aviation career after watching – in awe – President Woodrow Wilson’s plane fly over Cleveland during a campaign stop. Rushing back to Mechanical Arts High School, she could not wait to tell classmates she was going to be a pilot. After school and on weekends, Phoebe could be seen staring at the Orioles and Jennies through the chain linked fence at Curtiss Northwest Flying Field. Although, she felt sure someone would offer her a ride it never happened. Finally, she slipped through the fence and told one of the men near a Jenny that she was interested in buying it. Again Phoebe was thwart. The man let her look around even allowing her to sit in the Jenny’s seat, but said she would have to purchase the plane if she wanted a ride. She needed $3,500 to buy the WWI refurbished airplane. Unfortunately, her odd jobs after graduation in 1920 were not enough. Being a fan of The Perils of Pauline series, she visited the Fox Film Corporation that had a branch in Cleveland. Pauline did lots of outrageous stunts and Phoebe convinced them into allowing her to parachute from an airplane dressed as the character. With money saved and a loan based on the parachute contract, Phoebe finally had enough to purchase her “big beautiful Jenny!” The salesman not only gave her the first ride, but threw her around in the cockpit with a “quick, violet shake” that resulted in a stall and spin. What was meant to scare her away only thrilled her more. Ironically, Phoebe now owned a plane that no one would teach her to fly. Her first and seemed like last flight was that cold day in January. It was late spring before she finally found a “25-year-old veteran of the Great War,” Capt. Vernon Omlie. He stood tall and handsome next to the Jenny as she told him all about the “contract.” That day, she listened as he explained the art of wing walking. 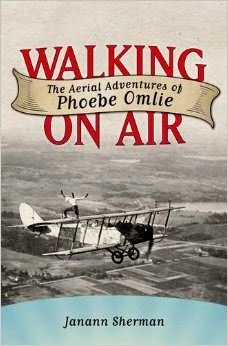 Walking on Air: The Aerial Adventures of Phoebe Omlie by University of Memphis professor, Janann Sherman is a thrilling then sad ride. Although, the new Memphis Air Traffic Control Tower at Memphis International Airport bears her name, she still remains a stranger. Ibby Bell gaped at all the bright colored houses and wrought iron fences as they rolled slowly down Prytania Street in the Garden District of New Orleans. In her excitement to get a better look at the some of the mansions, she started to readjust her position on the green vinyl. Mistake. That embarrassing noise was coming from below her bare legs as she tried to move her sweat-cemented self from the front seat. Ibby grimaced as she looked at the once glorious home. It was a two story Victorian with an imposing cupola on top. Above the cupola sat a weather vane that was no longer vain. The racing horse would not turn into the wind. The horse’s hoof sat forever trapped in rust and one side of the propeller laid pointing to the sky in the gutter. Her eyes fell down to the second story where she could see a window covered over with plywood in the turret. An old Oak Tree was leaning so close to the space that one could imagine the Spanish Moss tickling the house. Ibby figured it must have caused the broken window. Ibby took the green handled urn from its place of honor between the two of them and opened the car door. As soon as she placed her red sneakers on the curb, Vidrine gave her a little push. She stood, urn in hand, and shut the door. Once the car door was shut, Vidrine wasted no time leaving. She yelled out, “Now don’t forget to tell her what I said!” as the car squealed into the curve. Ibby turned toward the house wondering why she had to meet her grandmother alone. 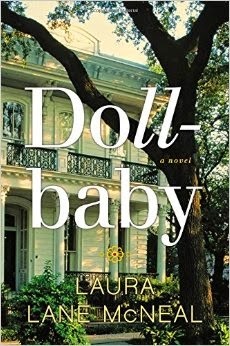 Dollbaby is a unique story set in 1964 New Orleans by first time author, Laura Lane McNeal. One of my favorite memories at Como Public Library was Community Helper Day. All the little first graders from Como Elementary would file into the library for a tour. Activities included throwing things in the book drop (always fun), scanning books to make the beep, and pushing the book cart around. They left with a book bag filled with coloring sheets, crayons, candy, and a library card application. At the time, Como Main Street included the police station, firehouse, city hall, library, doctor/dentist office, restaurants, and bank. You could watch the little ones centipede to each building and wave at the helpers who greeted them smiling. It felt like an important day. Cloverleaf books’ Community Helpers series, published by Millbrook Press, uses a unique author/illustrator combination to assure uniformity. Half of the eight books were written by either Gina Bellisario or Bridget Heos. The four illustrators have two books to their credit and are Cate Atkinson, Mike Moran (no relation), Ed Myer, and Kyle Poling. All illustrators obeyed a round, long, or triangular face rule and maintained the same color pallet. These picture books all begin with Let’s Meet a … followed by the corresponding helper. Helpers include a construction worker, dentist, doctor, firefighter, librarian, police office, teacher, and veterinarian. Since there are eight, teachers can read two a day for four days with a tour at the end of the unit. The series format is uniform and includes three chapters, an activity, a glossary, and further readings. The chapters for Librarian are “The Spy,” “No Shushing Allowed!” and “A Computer Wizard.” The activity is finding a book and the glossary has words like catalog, e-book and troubleshoot. The further reading section suggests the website kidsclick.org. I particularly like the Construction Worker book. They are building a new school for the children complete with a playground. Oh, but that is in the future. Right now it is a mound of dirt where they can play "King on the Mountain" wearing fake-plastic orange construction hats. The activity is to construct a graham cracker house using peanut butter. What a mess! I would read this book in the afternoon and reserve the activity for close to last bell. A little less messy would be to hand out blue construction paper and let them draw up blueprints for the house using chalk. Don’t forget we look up to you, community helpers. After reading this series, you will have even more admiring eyes.